I am Raising a Readasaurus! Last summer, our family participated in the TD Summer Reading Club, which I wrote about HERE. I was excited to know that our local public libraries have put great effort into being more accessible and accommodating to people who experience reading in different ways. They have a good selection of audio books available, as well as print materials in alternative formats, such as e-text and braille. 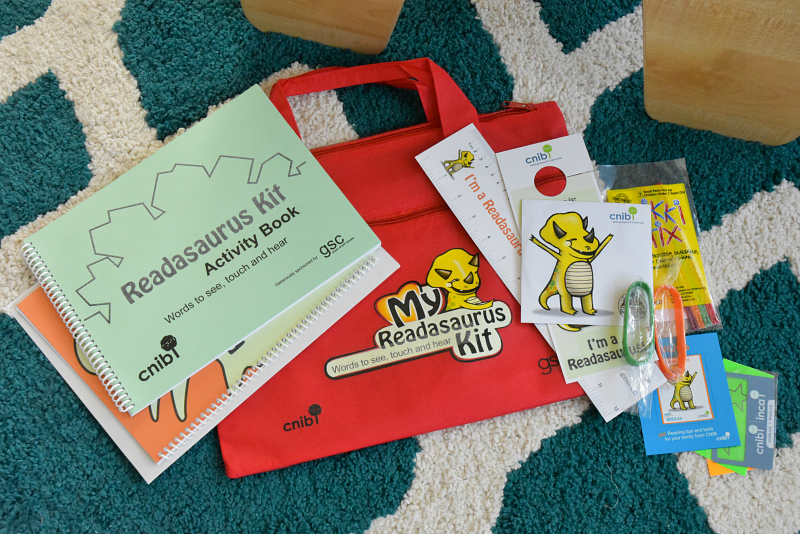 We recently received another package from the CNIB, that included our very own Readasaurus Kit - a fun and practical tool to help develop essential early literacy skills in children with vision loss. Brennen has cortical visual impairment (CVI), which means that he has a decreased visual response due to damage to his brain. 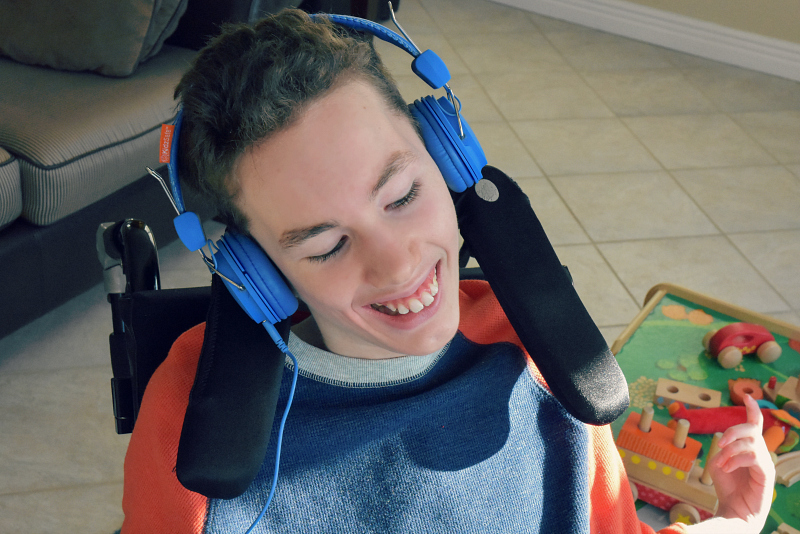 For Brennen, it is not an issue with his eyes, but more an issue with how his brain interprets visual input. CVI is a brain problem rather than an eye problem, and it is common in individuals with cerebral palsy. Our girlie, on the other hand, has no vision, and we are constantly searching for ways to stimulate her and to enhance how she experiences the world. 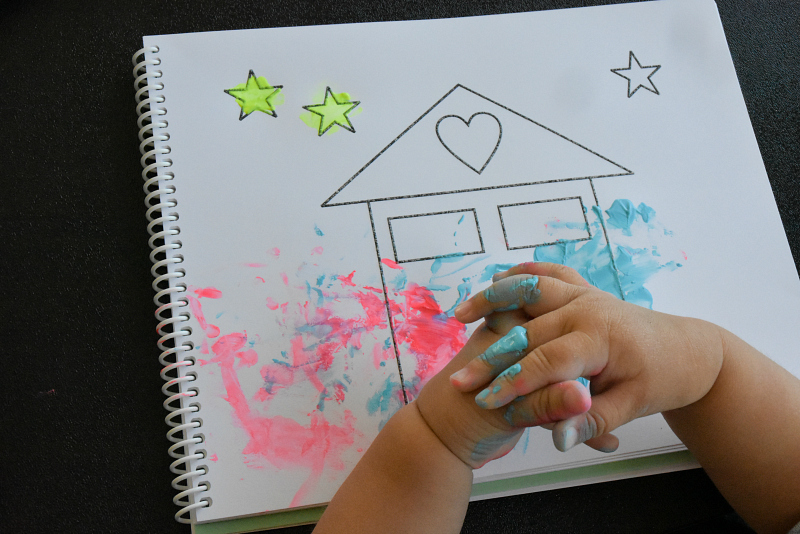 Sighted children often learn by watching and imitating, but children who are blind or partially sighted need hands-on, active learning opportunities. 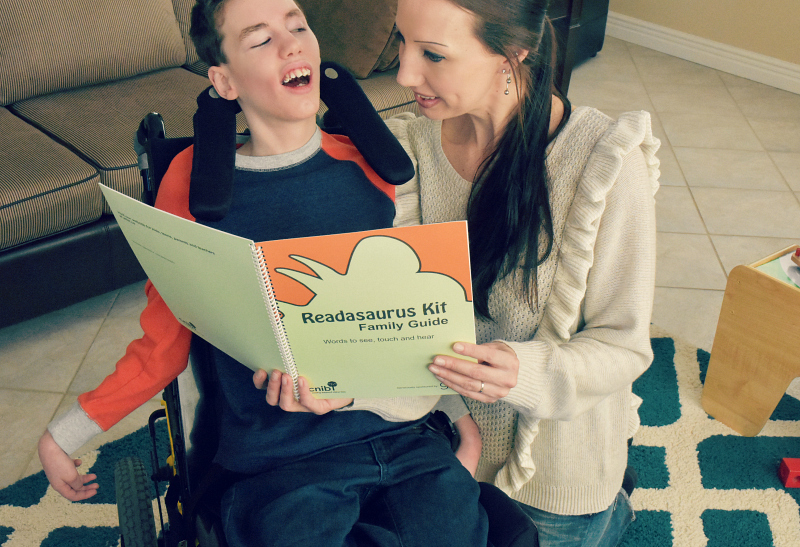 The Readasaurus Kit was developed by the CNIB with input from early intervention specialists, teachers, rehabilitation workers and library staff as a fun tool for parents and children. The kit contains a Family Guide outlining the importance of literacy and family story time, as well as highlighting the types of books to share with children with vision loss. 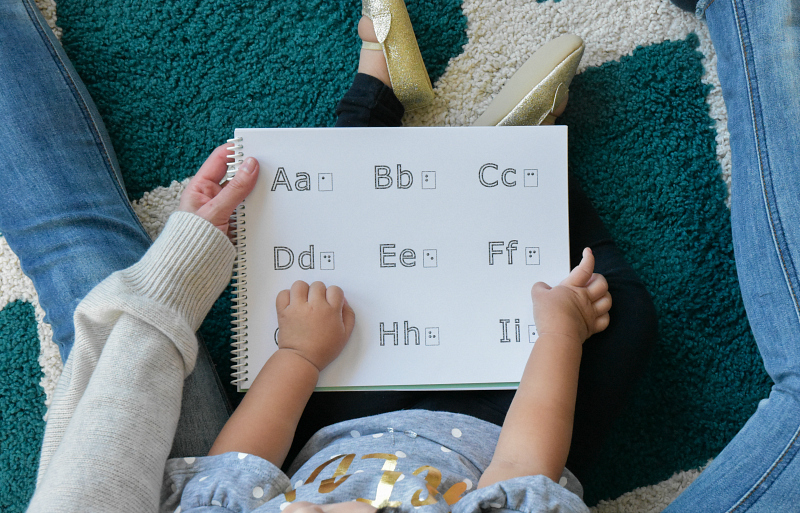 When I opened our package, I was excited to dive in to the materials, which included braille stickers for common words that appear in many books for kids, and an activity book of "Words to see, touch and hear". There was also a magnifier and braille ruler, some shape stickers and magnets, a package of Wikki Stix, and some glow-in-the-dark "braille is fun" wrist bands! 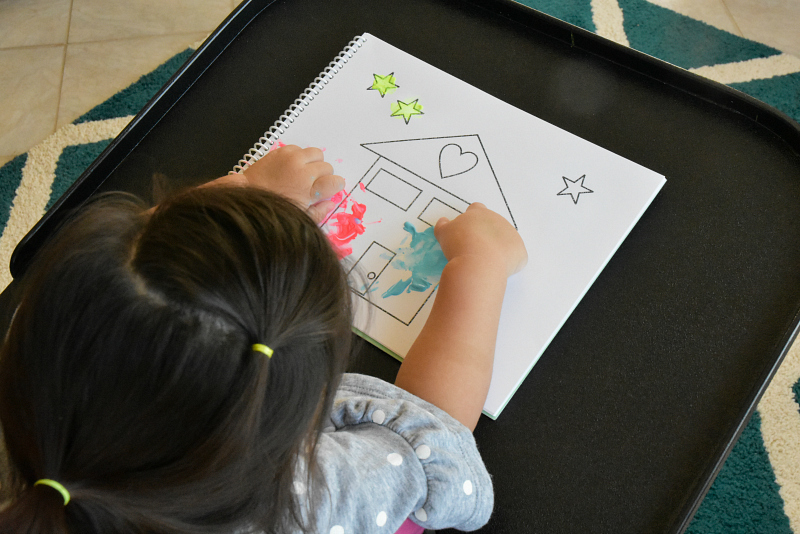 What I love about this kit is that while it includes lots of fun activities for our children, it is also focused on giving parents information about how to best help them learn. 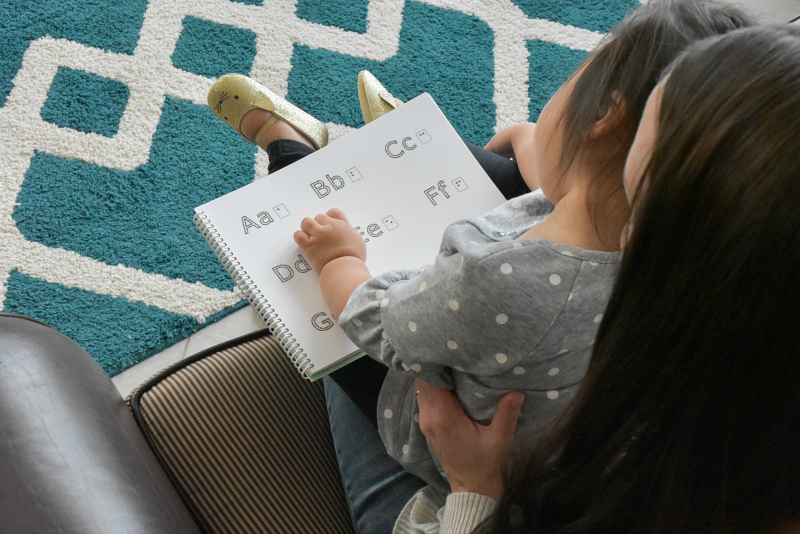 There are ideas on how to teach your child to listen, how to help them gather information about the world through touch and movement, and strategies to help your child collect, organize and understand information. I am so excited about this! Like I said, Andrew and I are eager to find ways to help our children learn and explore, and to offer them new ways to enrich their lives every day. We had gotten into a bit of a routine with Brennen, after thirteen years of figuring out what works and what doesn't work for him, but with two little ones in the mix, our life is in constant motion so I am grateful for resources like this one that push us to get creative and try new things. Our girlie just loved the Activity Book. 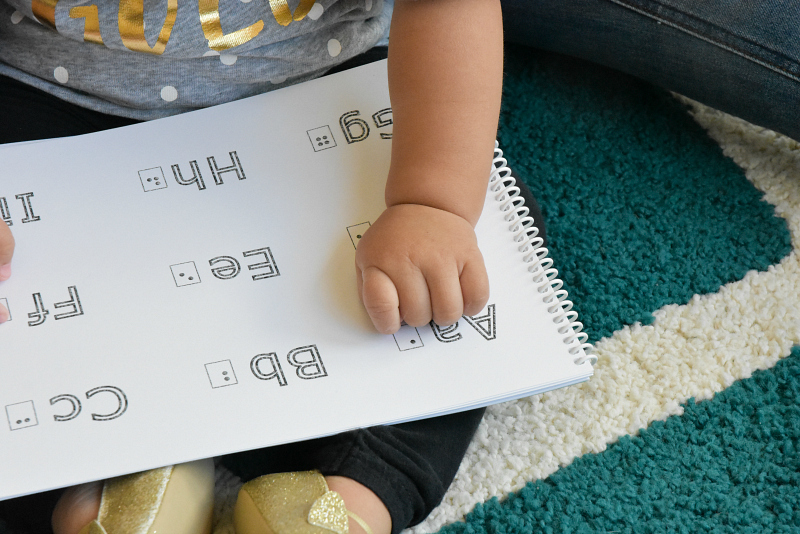 We spent some time on the tactile pages, letting her feel the numbers and letters at her own pace before moving on to the next one. We then used finger paint on the colouring pages! I love that the lines of the pictures are raised, creating a textured border outlining the images. Our kit also included a disk with three audio stories from the Dolly Parton Imagination Library, that Brennen enjoyed listening to on his headphones. 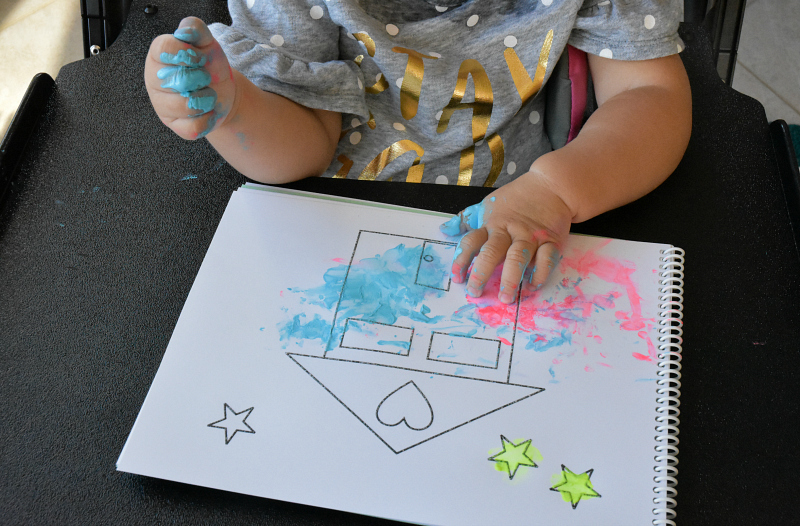 We have been having a great time with the activities included in the Readasaurus Kit, and I am excited to try some of the ideas suggested in the Family Guide, like how to adapt or modify existing books, and how to make our own books with textures and tactile elements. The guide also contains many helpful links to online resources specific to promoting literacy in kids with vision loss. Parenting children with special needs is a constant learning process, but it is so incredibly rewarding. Our children have changed our lives in so many positive ways, and we will continue to invest our time, love, and energy into each of them, celebrating their accomplishments and supporting their unique needs. It is an honour and a joy to watch them develop, and with help from organizations like the CNIB, we will continue to grow and learn right along with them. You Must See This Play! Earlier this year, I attended a stage reading of "Crippled", a play in development by playwright Paul David Power. (I wrote about that HERE.) It was such a powerful and emotional performance. I fell in love with the story and the characters and just knew that this play was going to be something special. “Crippled” is about Paul’s experience living with a physical disability since birth as well as dealing with grief after the death of his partner. The piece is designed to show that a disability does not define a person’s overall identity - there are many facets to a person and physical difference is just one component. “Crippled” shows rather than tells the importance of diversity, understanding and acceptance. It is unlike any other work dealing with disability currently on our provincial theatre scene. Paul has been developing "Crippled" for two years, and has been successful in securing a grant from the Canada Arts Council’s Cultivate Grant Program – dedicated to supporting deaf and disability arts in Canada. This past August, a working version of "Crippled" was performed at the Fundy Fringe Festival in Saint John, NB. This presentation received 5 star reviews and went on to capture the award for Outstanding Production at the festival! I am thrilled to now be on the production team for "Crippled". Watch this quick video, to see why this production means so much to me! 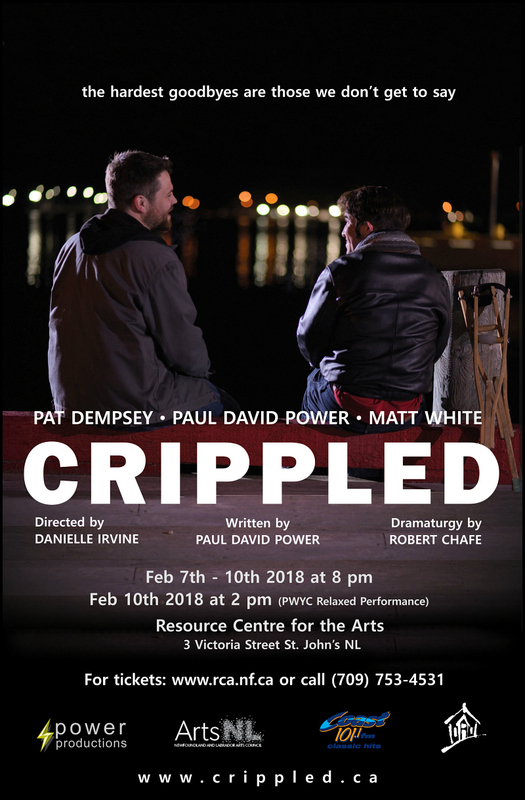 "Crippled" is premiering at the historic LSPU Hall (Resource Centre for the Arts) here in St. John's on Wednesday, February 7th, and running until Saturday, February 10th. Tickets are available now! Click HERE to purchase! The incredible team at Power Productions is raising the bar when it comes to theatre accessibility in Newfoundland and Labrador. It is Paul's hope that “Crippled” will not only entertain, but also inspire discussion and action to expand the diversity of our local theatre scene for artists living with a disability. Historically, in our province, accessibility to events, including the arts, has always come as an afterthought. A priority of this production is to play a leadership role in demonstrating how a community event can be truly accessible. “Crippled” will include such access supports as ASL interpreters, audio description, pre-show sensory set visits, and extra space beyond the norm for wheelchairs and other mobility aids. ASL interpretation is available for the 8:00 pm shows on February 7th and 10th. Audio description is available for the show on February 9th at 8:00 pm, as well as February 10th at 2:00pm. This matinee is also a relaxed, pay what you can performance. For more information about the accessibility accommodations for "Crippled", check out the Accessibility Guide that was developed in partnership with InclusionNL. I truly believe this is a performance that everyone should see. Not only those in the disability community, or the LGBT community, or the arts community, or the whatever community. "Crippled" tackles hearty issues relevant to all of us as human beings. Paul tells his story through soulful and carefully selected words, hiding nothing and expressing his true creative self. In doing so, he removes all barriers, labels, and stigma, and generates meaningful conversation around the themes of inclusion, acceptance, prejudice, loss and mental well-being. As you know, I am eager to support those who strive to make things better for people with disabilities, and even more so, I am happy to support people with disabilities who are striving to make things better for themselves, but Paul is not just a 'disabled actor and playwright'. He is a talented artist - a creative force who is passionate about his work and he has an incredible power to make people feel deeply. I'll stand behind anyone who does that.